Saint Anthony (or Antony) the Great, "star of the wilderness" and "father of all Christian monks," is a greatly beloved figure of the ancient Christian world. Though he was certainly not the first Christian to leave the cities for a life of solitude in more remote areas, Antony stands prominently as the hugely popular father of the important Desert Father-Mother movement in upper Egypt. The movement soon spread this eremetic (hermit) and cenobitic (communal monastic) form of deeply meditative, very austere, and psychologically rigorous Christian spirituality over to Palestine, Syria, Greece and beyond. Not long afterwards, the movement crossed the Mediterranean sea to Italy and thence to much of Europe. On this webpage, we can peruse the biographical details about St. Anthony/Antony the Great, and then read the spiritual teachings from this great Christian master of meditation and morality as preserved by the tradition. Here's the biography of St. Anthony, which, for convenience, I have drawn, with slight changes and corrections of grammar and punctuation, from a good basic account of the saint by an anonymous author for Wikipedia [http://en.wikipedia.org/wiki/Anthony_the_Great]. Other articles on the Life of Anthony are available on the internet, such as from the online Catholic Encyclopedia. Most of what we know about the life of St Anthony is in the Greek Vita [Life] by Athanasius (d. 373), which soon circulated in Latin. Several surviving homilies [from Apophthegmata Patrum, Sayings of the Fathers, and works of Cassian and Palladius] and epistles provide his teachings. Anthony was born near Heraclea in Upper Egypt around 251 to wealthy parents. When he was twenty years old, his parents died and left him with the care of his unmarried sister. In 285, he decided to follow the words of Christ who had said: "If you want to be perfect, go, sell what you have and give to the poor, and you will have treasures in heaven; and come, follow Me." (Matthew 19:21). Anthony gave his wealth to the poor and needy, and placed his sister with a group of Christian virgins, a sort of proto-nunnery at the time. By the 2nd century, there were also famous Christian ascetics, such as Saint Thecla. Saint Anthony decided to follow this tradition and headed out into the alkaline desert region, called the Nitra in Latin (Wadi al-Natrun today), about 60 miles west of Alexandria, some of the most rugged terrain of the Western Desert. According to Athanasius, the devil fought St Anthony by afflicting him with boredom, laziness, and phantoms of women, which he overcame by the power of prayer, providing a theme for Christian art. After that, he moved to a tomb, where he closed the door on himself, depending on some local villagers who brought him food. When the devil perceived his ascetic life and his intense worship, he was envious and beat him mercilessly, leaving him unconscious. When his friends from the local village came to visit him and found him in this condition, they carried him to a church. After he recovered, he made a second effort and went back to the desert, further out, to a mountain by the Nile, called Pispir, now Der el Memun, opposite Arsinoë in the Fayyum. Here he lived strictly enclosed in an old abandoned Roman fort for some 20 years. According to Athanasius, the devil again resumed his war against Anthony, only this time the phantoms were in the form of wild beasts, wolves, lions, snakes and scorpions. They appeared as if they were about to attack him or cut him into pieces. But the Saint would laugh at them and say, "If any of you have any authority over me, only one would have been sufficient to fight me." At his saying this, they disappeared as though in smoke, and God gave him the victory over the devils. While in the fort, he only communicated with the outside world by a crevice through which food would be passed and he would say a few words. Saint Anthony would prepare a quantity of bread that would sustain him for six months. He did not allow anyone to enter his cell: whoever came to him, stood outside and listened to his advice. The backstory of one of the surviving epistles, directed to Constantine the Great, recounts how the fame of Saint Anthony spread abroad and reached Emperor Constantine. The Emperor wrote to him, offering him praise and asked him to pray for him. The brethren were pleased with the Emperor’s letter, but Anthony did not pay any attention to it, and he said to them, "The books of God, the King of Kings and the Lord of Lords, commands us everyday, but we do not heed what they tell us, and we turn our backs on them." Under the persistence of the brethren who told him, "Emperor Constantine loves the church," he accepted to write him a letter blessing him, and praying for the peace and safety of the empire and the church. Next he went to the Fayyum and confirmed the brethren there in the Christian faith, then returned to his old Roman fort. Anthony wished to become a martyr and went to Alexandria. He visited those who were imprisoned for the sake of Christ and comforted them. When the Governor saw that he was confessing his Christianity publicly, not caring what might happen to him, he ordered him not to appear in the city. But the Saint didn’t heed his threats. The Governor faced Anthony and argued with him in order that he might arouse his anger so that he might be tortured and martyred, but it did not happen. Then Anthony went back to the old Roman fort and many came to visit him and to hear his teachings. He saw that these visits kept him away from his worship. As a result, he went further into the Eastern Desert of Egypt. He travelled to the inner wilderness for three days, until he found a spring of water and some palm trees, and then he chose to settle there. On this spot now stands the monastery of Saint Anthony the Great (see below). On occasions, he would go to the monastery on the outskirts of the desert by the Nile to visit the brethren, then return to his inner monastery. According to Athanasius, Anthony heard a voice telling him, "Go out and see." He went out and saw an angel who wore a girdle with a cross, one resembling the holy Eskiem (Tonsure or Schema), and on his head was a head cover (Kolansowa). He was sitting while braiding palm leaves, then he stood up to pray, and again he sat to weave. A voice came to him saying, "Anthony, do this and you will rest." Henceforth, he started to wear this tunic that he saw, and began to weave palm leaves [as a way to ward off boredom]. Anthony prophesied about the persecution that was about to happen to the church and the control of the heretics over it, the church victory and its return to its formal glory, and the end of the age. When Saint Macarius visited Saint Anthony, Anthony clothed him with the monk’s garb, and foretold what would become of him. When the day drew near of the departure of St Paul the First Hermit in the desert, Anthony went to him and buried him, after clothing him in a tunic which was a present from St Athanasius the Apostolic, 20th Pope of Alexandria. 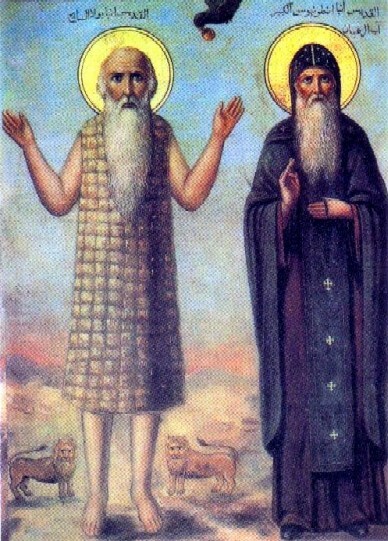 When Saint Anthony felt that the day of his departure had approached, he commanded his disciples to give his staff to St Macarius, and to give one sheepskin cloak to St Athanasius and the other sheepskin cloak to St Serapion, his disciple. He further instructed his disciples to bury his body in an unmarked, secret grave, lest his body become an object of veneration. He stretched himself on the ground and gave up his spirit. St Anthony the Great lived for 105 years and departed on the year 356. Probably he spoke only his native language, Coptic, but his sayings were spread in a Greek translation. His biography was written by Saint Athanasius the Apostolic and titled Life of Saint Anthony the Great. Many stories are also told about him in various collections of sayings of the Desert Fathers. Some of the stories included in Saint Anthony’s biography are perpetuated now mostly in paintings, where they give an opportunity for artists to depict their more lurid or bizarre fantasies. Many pictorial artists, from Hieronymus Bosch to Salvador Dalí, have depicted these incidents from the life of Anthony; in prose, the tale was retold and embellished by Gustave Flaubert. Founder of monasticism—St Anthony and Paul the Hermit are seen as the founders of Christian monasticism. Paul is lauded by Anthony as the first monk and the cell of Paul exists to this day in Egypt. Anthony himself provided the example that others would follow. Anthony did not himself organize or create a monastery [other accounts say that he did sponsor the founding of some monastic communities], but such grew up around him based on his example of living an ascetic and isolated life that others wished to follow, and who needed the community and company of others to survive the harsh conditions. The fortress-like Monastery of St Anthony the Great, at Deir El-Kedees El-Anba Antonios, stands at an oasis spring in the Red Sea Mountains, 155 km (100 miles) southeast of Cairo. It was founded in the mid-4th century, perhaps in 356, on Anthony’s burial site. This Coptic Orthodox monastery, presided over by an abbot, is one of the oldest Christian monasteries in the world. The church is one of Egypt’s great treasures—some of the wall paintings here date from the sixth and the ninth centuries, and among them is a picture of the founder, St Anthony himself. He lived in a tiny cave, high above the desert, for 40 years soon after AD 300, and the monastery—really a city in the desert—was built in the 360s. The monks who live here still speak Coptic, a language descended from the language of the ancient Egyptians. On the greatest early proponent of this way of Christian ascetic mysticism, St. Anthony the Great (251-356), see the Life of St. Antony written by St. Athanasius (various translations, some online); The Letters of Saint Antony the Great, translated by Derwas Chitty (Fairacres, Oxford OX4 1TB: SLG [Sisters of the Love of God] Press, 1975). See also Chitty’s translation of a collection of letters by a disciple of St. Antony, The Letters of Ammonas (SLG Press, 1979). British Anglican nun Benedicta Ward translated and edited some excellent works, The Wisdom of the Desert Fathers: Systematic Sayings from the Anonymous Series of the Apophthegmata Patrum, SLG Press, 2nd ed., 1986; and a larger work, The Desert Christian: Sayings of the Desert Fathers: The Alphabetical Collection, NY: Macmillan, 1975. Thomas Merton put together a little collection of stories with a good introduction entitled The Wisdom of the Desert, New Directions, 1960; Helen Waddell did a fine excerpting from several sources of sayings and biographies in her The Desert Fathers, U. of Michigan Ann Arbor ed., 1957 (first publ. in 1936). Two essential and quite interesting biographical works are The Lives of the Desert Fathers: The Historia Monachorum in Aegypto (Norman Russell, Tr., introd. by Sr. Benedicta Ward), WMU Station, Kalamazoo, MI 49008: Cistercian Publications, 1981 (an eyewitness work by one of seven Palestinian Christian monks who traveled as a group through the Egyptian desert in 394); and Palladius: The Lausiac History (Robert Meyer, Tr.) Westminster, MD: Newman Press, 1965. Palladius was an eye-witness pilgrim in Egypt, Syria, Palestine and Asia Minor in 419-420. Among other interesting things, Palladius observed that in Egypt (birthplace of this type of Christian holiness based on hesychia), Desert Mothers outnumbered the Fathers by a factor of two to one: an estimated 20,000 women monastics and anchorites compared to 10,000 men. See B. Ward’s The Desert Christians for teachings from Desert Mothers, Syncletica, Theodora, Sarah. See also John Binns, Ascetics and Ambassadors of Christ: The Monasteries of Palestine, 314-631 (Oxford, UK: Clarendon Press, 1994) for more of what transpired up in Palestine. [Antony speaks here of the intellect, nous, our highest faculty, not mere reason, but that which can understand the Divine via immediate experience, intuition, or “simple cognition”:] “Holiness is achieved when the intellect is in its natural state.” “The soul realizes its integrity when its intellect is in that state in which it was created.” “Let us purify our mind, for I believe that when the mind is completely pure and is in its natural state, it gains penetrating insight, and it sees more clearly and further than the demons, since the Lord reveals things to it.” (Quoted by St. Hesychios the Priest, in Philokalia).